Great Britain Speedway Team has added another expert to its performance team, with Psychologist Jeremy Holt joining the team ahead of the 2019 season. Jeremy is a Chartered Occupational Psychologist with over 24 years’ experience working with top-level sports teams and high-ranking military officials. His work has seen him work alongside the Olympic Gold medal winning Great Britain Women’s Hockey Team, Warwickshire County Cricket Club, the Great Britain Men’s Wheelchair Rugby Team and the Scotland Rugby National Team – who he continues to work alongside. 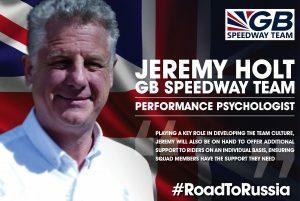 Jeremy joins up with Great Britain's Head of Performance, Chris Neville, and he explained a little bit more about his work. “My job is to help to build shared beliefs among teams, and that’s the athletes, the backroom team, the partners – everybody. I try to build a shared belief about who we are as a team, what it means to represent that team and to build a culture that affects every little decision the athlete makes. As well as playing a key role in developing the team culture, Jeremy will also be on hand to offer additional support to riders on an individual basis, working closely alongside the performance team to ensure squad members have the support they need. GB Managing Director, Rob Painter is delighted to welcome another field-leading specialist to the backroom team, saying: “Chris, Jeremy and I met up at the back end of last year and I was extremely impressed with Jeremy’s plans for the team and his enthusiasm for our project. “He has a wealth of knowledge and experience and it’s great to have him on board, the psychological aspect of all sport is huge, but even more so in Speedway where riders have to abandon their individual mindset for two or three occasions a year when they ride for their country. We have an in-depth interview with Jeremy to be released on gbspeedwayteam.com later this week, where he talks about his work and his plans for the team. Keep your eyes peeled!